Is Donald Trump Even Trying in Iowa? 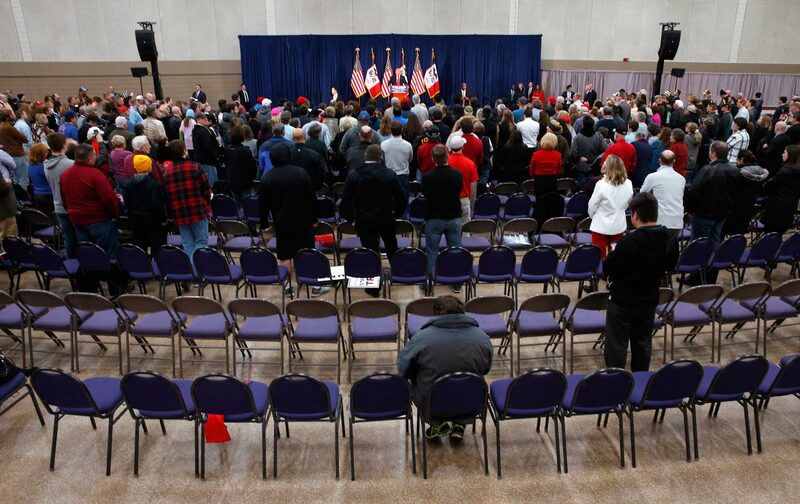 If this morning’s low-energy, low-turnout event is any indication, Trump could be in real trouble tonight. Waterloo, Iowa—A low-energy crowd greeted a low-energy Donald Trump in Waterloo, Iowa, Monday morning. Jeb Bush would have loved it. It may not tell us anything about caucus turnout—it was a workday morning, after all—but it was a strange moment nonetheless. Trump acknowledged the low turnout early, calling the diminutive crowd “our very close friends,” then saying, “I’m gonna get out of here fast,” for his next event in Cedar Rapids. The crowd groaned, and Trump reassured them. “No, no, we’re gonna take care of you. Win, lose or draw, I love you all.” He gave a perfunctory 35-minute speech at what I can’t even call a rally. Not a soul was attempting to identify voters and make sure they know where their caucus site is. The crowd applauded Trump respectfully, but without a lot of fervor; his speech was never interrupted by their enthusiasm. “The big thing is, you gotta go caucus,” he ended. About his rivals he complained, “I hear they all have these great ground games, they’re spending all this money that they’re getting from the special interests. I spent less money than anybody else, and I have the best result.” We’ll see. Remarkably, there was no evidence of organizing even at this caucus-day rally; the campaign was selling its famous gear in the lobby, but not a soul was attempting to identify voters and make sure they know where their caucus site is. I met Trump supporters who promised to caucus nonetheless. Michele Foley, an independent Mary Kay director, says she’s never caucused before but she will tonight for Trump. “I’m tired of where the country is going. I’m voting to take the country back, I’m not happy with anything Obama has done.” Still, Foley hasn’t been contacted by the campaign; she went to the website herself and figured out the caucus rules and where to show up at 7. Trump stayed and signed autographs for about 100 people who pressed forward. Mostly everyone else filed to the exits to carry on with their day. Whether their day will include caucusing, we’ll learn tonight.